Background: The domain of context-aware recommender approaches has made a substantial advancement over the last decade, but many applications still do not include contextual information while providing recommendations. Contextual information is crucial for various application areas and should not be ignored. Objective: There are generally three algorithms which can be used to include context and those are - pre-filter approach, post-filter approach and contextual modeling. Each of the algorithms has their own drawbacks if any single approach is chosen. 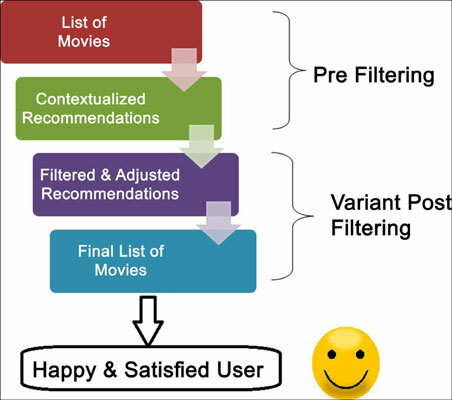 The goal of this work is to identify and propose a new hybrid approach which can include contextual information to improve the current movie recommender systems. Method: Post evaluation of various patents related to recommender systems, the proposed approach modifies the post filter approach to rectify its shortcomings and combines it with the pre-filter approach based on the importance of contextual attribute provided by the user. Results: The performance of the proposed system is measured in terms of precision of the system and ranking of the recommended movies to the user. The results of experimental setup also demonstrate that the proposed system improves the precision and ranking of the recommendations provided to the user. Conclusion: With the help of this hybrid approach, the proposed system eliminates the problem of sparsity which is present in the pre-filter algorithm, and has performance improvement over the traditional post-filter approach. The proposed system will be vital for movie ticketing brands for the promotional purposes and various online content providers to recommend the accurate movies to their users. Context awareness, filtering algorithms, hybrid intelligent systems, post-filter, pre-filter, recommender systems.